CleanMail Hosted Email Security works with any existing mail server like Microsoft Exchange, Lotus Notes/Domino, IMail etc. and protects you against all kinds of junk mails containing spam, viruses and phishing attacks. Nothing to install or maintain, just clean mail! CleanMail protects Microsoft Exchange, IMail, Lotus Domino/Notes and any other mail server against all kinds of junk mail containing spam, viruses and phishing attacks. Please see the CleanMail feature list for detailed information. By a simple change in the DNS MX record for your domain, all incoming emails are immediately diverted to the CleanMail Email Security servers. 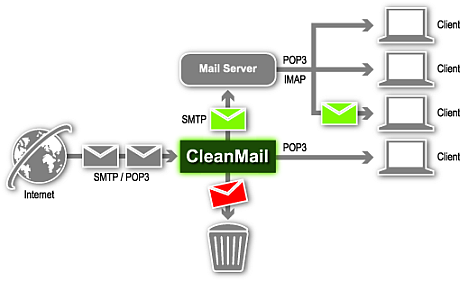 Only clean mails are delivered to your existing mail server. If an e-mail is recognized as spam, it is either quarantined or redirected. The CleanMail Dashboard provides administrators or end users with statistical data and allows them to manage quarantined emails. CleanMail Hosted Email Security offers the full range of state-of-the-art mail filtering technology, including the award-winning SpamAssassin, an attachment blocker and anti-virus protection. CleanMail Hosted Email Security protects any existing mail server against all kinds of junk mail containing spam, viruses and phishing attacks. No hardware or software required - nothing to install or maintain, no staff training required. Only a simple DNS/MX change needed - quicker to implement than any software solution. Rejects unwanted emails before they hit your mail server - the best solution technically and legally. Keeps spam & virus mails away from your corporate network - saves network bandwidth and storage space. Platform independent - works with any existing mail server. Prevents denial of service attacks on your corporate mail servers. Prices for this service start as low as US$/EUR 0.55 per recipient address and month. Please see the order page for details. Get rid of spam now - start your free, fully functional trial and see how easy it is to set up and use CleanMail. Nothing to install or maintain, just clean mail! Works with any existing mail server - only a simple change in your domain's DNS/MX record needed. More than 500,000 users worldwide rely on Byteplant products every day. But don't just take our word for it - read what our customers say and start your free trial now!